Winter along San Francisco's coast brings the opportunity to see the migration of hundreds of giant Gray Whales. However, another lesser-known wildlife viewing opportunity in winter is the Elephant Seal breeding colony on a beach below Chimney Rock on Drake's Bay. Elephant Seals can reach 16 feet in length and weigh in excess of three tons. The sound of trumpeting males (bulls) can heard a mile away. The bulls arrive first in December and stake out a location on the beach. They are then followed by the pregnant females who eventually give birth to a single pup. Elephant Seals spend 80 percent of their lives in water and are able their breath underwater for over two hours, making the birthing period one of the few extended periods they are on land. By March the breeding pairs are gone, leaving behind some smaller, younger Elephant Seals on the beach. Tomales Point, not far from Chimney Rock, is home to another wildlife species. There, a herd of hundreds of Tule Elk freely roam 2,600 acres of open grassland and coastal scrub. The Tule Elk, once virtually extinct, are shown here having lost their seasonal antlers. 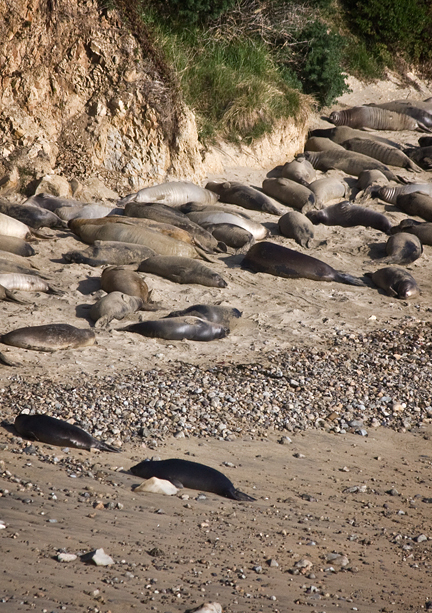 Both the Elephant Seals and the Tule Elk can be viewed in the Point Reyes National Seashore, about 25 miles north of San Francisco.